by massive upheaval due to swiftly changing Social, Political and Economic events, particularly of the 18th and 19th Centuries. attached to Voluntary General Hospitals, this being Non–Compulsory, Counties were reluctant and development was slow. 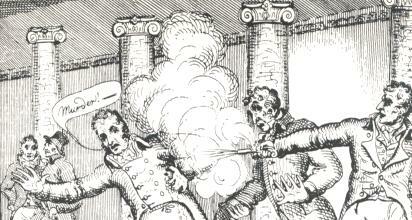 May1812 Spencer Percival, the then Prime Minister, was assassinated by John Bellingham. He was an alleged Lunatic who speedily went to trial within a few days. Following a very short trial where there were no witnesses called, he was found guilty, sentenced and despite some strong arguments as to his Insanity being dismissed, he was expediently hanged. This created great Public and Political debate thereby adding to the growing Political and Social pressures to “take such people off the streets and house them appropriately” . One of the first to be built – including Nottingham, Bedford, Norfolk and Lancashire – before the massive nationwide programme started . . . . .
1818 – Opening of Stafford County Lunatic Asylum – Designed by County Surveyor Joseph Potts and constructed of red brick in the Georgian Mansion style, being a huge 4 stories high. It was situated to the North East of Stafford Town near to the County Gaol. Sitting on a slightly elevated site overlooking the marshes, set in approximately 40 acres of grounds and gardens, it was a very imposing establishment. At a cost of approximately £35,000 it was to originally house up to 120 patients. Eventually this would be found to be woefully inadequate and further extensive additions and modernisations would be needed around 1849/1850. By 1879-The S. East Wing, and 1884-The N. West Wing. Originally it was to take in patients from several other Counties – Derbyshire, Cheshire,Worcestershire, Warwickshire, Leicestershire and Northampton – No Pressure then – (By the 1830’s only Warwickshire and Leicestershire were still sending patients to Stafford). It was predominantly to take in only pauper and working class lunatics, but the leading Nobility and Gentry of Staffordshire promised and donated upwards of £3,500 towards a portion of the building for Private Patients, and again regarding Coton Hill Hospital see (1851-1854). The hospital was transferred to management of the National Health Service in 1948 and renamed later as St Georges Hospital. . . .
1831/1832 – Staff in situ during this period were Mr John Garrett the House Surgeon/Superintendant, Dr Knight the Physician, Mrs Mary Turner the Matron and The Rev Buckeridge as the Chaplain, The Management Committee or Committee of Visitors included – The Earl of Harrowby as President, Sir Robert Peel M.P. as the Vice President, The Magistrates and Principle Subscribers as the Committee of Visitors. A report covering part of this period shows that the number of patients averages about 200 of which approx. 100 are Paupers, the weekly sum of 6 shillings being paid for their maintenance etc. out of the Poor Rates of their respective Parish/Townships. One part of the Asylum is set apart for those from the higher walks of life (Private), in two Classes – Upper Class being those who have previously moved in good circumstances – Lower Class who were previously from more humble walks of life. They being accommodated according to the wishes and payments of Friends etc. A Subscription Fund has been liberally supported for the relief of those whose Friends, not receiving Parochial Relief, are unable to defray the whole of the weekly charge for Private patients. The deficit arising for the Upper Classes is made up, out of The Fund, to 16 shillings per week. For the Lower Class the deficit is made up, out of The Fund, to 12 shillings per week. Any surplus from the Subscription Fund and Private Fees went towards defraying the expenses of Pauper Lunatics. From Oct 1818 to Dec 1832 the total number of patients shown to be admitted was 1604, of whom 693 were recovered, 190 relieved, 88 removed by desire of their Friends, 185 removed by Overseers as incurable but harmless, 259 dead, and 189 remaining in the Asylum. September1838 The London to Birmingham Railway opened. The 1st main line in the world, 112.5 miles from Camden to Birmingham. It linked to the Grand Junction at Curzon St. Birmingham and this linked to Liverpool and Manchester, North of Warrington. This All Rail route of 206 miles took just over eight hours. This route and speed of travel made The National Inquiry 1842, into the Treatment of Pauper Lunatics, possible. The Railways and the Electric Telegraph taking messages along the side of the lines, also made it possible for more Frequent, Swifter, Unannounced Asylum-Inspection-Visits. This played a major part in preparing for the Legislation of a National Commission in Lunacy and subsequent 1845 Lunacy Act. 1841 – Mr James Wilkes aged 30, in situ as Medical Superintendant. A member of the Asylum Doctors Association and M.R.C.S. from 1835. Has been described as an enlightened man and reformer who would bring about many changes. He published a number of letters and articles in the Asylum Journal and in 1832 aged 21, wrote a prize essay on The Great Sympathetic Nerve for the Birmingham School of Medicine and Surgery. In 1842 reported on the benefits that better Heating and Ventilation brought throughout the Institution. He later stated in a report that from his experience, he now believed Mechanical Restraint was of little value and was most likely to be physically and psychologically injurious, to Patients and Staff alike. He wholeheartedly agreed with the beliefs of John Conolly etc regarding the practice of Non Restraint . . . . .
1843 The Mc Naughton Rule The First Legal Test for Insanity – Daniel Mc Naughton shot and killed the Secretary to the Prime Minister believing the Prime Minister was conspiring against him. The Court eventually acquitted him by Reason of Insanity and he was placed in a Mental Institution for the rest of his life. However the case caused a Public and Political Uproar and Queen Victoria ordered the Court to develop stricter tests for Insanity.The Mc Naughton Rule was eventually to create a Presumption of Sanity unless the Defence proved that the accused was under such a Defect of Reason as to Not Know that he was Doing Wrong. This went on to be universally adopted throughout the United Kingdom and in most of the United States. July1844 Lord Ashley intervened in a Debate on the state of the Poor Law to confirm from the 1842 Report that in many Workhouses there were confined a large number of Dangerous Lunatics and that in England and Wales there were 17,000 Pauper Lunatics and only Public Asylum Places for 4,500. This was another indicator towards better provision for such people. The Lunacy Act of 1845 This was a major, comprehensive piece of legislation. It was now a bold statement of Compulsory Requirement that Counties, Must-Build such Asylums. The powers of the Lunacy Commissioners were strengthened and importantly, funding was now the major responsibility of the Counties rather than the local Parishes. A noticeable side effect of this was that hard strapped Parishes began to push, those previously looked after by them under the Poor Law Acts, towards the Asylums. This relieved them of a heavy financial burden but substantially increased the demand for more Asylum beds. By the mid to late 1800’s Mr Wilkes noted Overcrowding. He stated that the Asylum, built to house up to 120 now held upwards of 250. This chiefly by the placing of extra beds in the open galleries and converting sitting rooms into dormitories. This being thoroughly unsatisfactory. 1851 He reported that in the previous year 30 patients were classified as Curable but 231 were Incurable and had grown to believe that everything depends upon Early Treatment with an 80% Recovery in cases Brought to a Proper Asylum within a Month of Symptoms being Shown. Current Staff consisted of Himself, Doctor Knight-Physician, Mrs Mary Turner -Matron. The Management Committee or Committee of Visitors consisted of :- The Earl Talbot, The Earl of Harrowby, the Visiting Magistrates – The Earl of Dartmouth, The Lord Wrottesly, and Major Chetwynd, Subscribers including The Lord Bishop of Lichfield and Thomas Salt Esq. Among the Males were :- 1 Lawyer, 1 Millwright, 1 Maltster, 1 Nailer, 1 Saddler, 1 Surgeon, 3 Servants, 1 Stone Mason and a Paper Maker. Among the Women were :- 1 Actress, 3 Ladies, 2 Potters, 2 Shoe Binders, 20 Servants and a Silk Doubler. Bread- £675 13s, Candles,Lamp Oil and Gas- £59 14s, Clothing- £257, Coffee, Currants and Raisins ? – £9 7s 8d, Fish and Poultry- £7 11s 9d, Furniture,Linen and Bedding- £1,047 2s 10d, Malt and Hops (Own Brewing)- £229 15s 4d, (Males had 1 pint each Dinnertime-Ladies had only 3/4 pint), Tobacco and Snuff-£22 13s, Straw for Cattle- £30 17s 10d, Salaries/Wages and Occasional Hire-£1595 19s, Medicines etc.- £52 8s 3d. Annual Expenditure is shown as being upwards of £5,500. Admission Rate was 179, more than the Aggregate number of Admissions during the three previous years. Total number of patients now being 440. He felt that this was not conducive, either for the Care, Recuperation, or Cure of Private – or the ever growing number of – Pauper Inmates, and now believed that the building of a separate Institution for Private Patients would help to alleviate many of these problems . . . . . This was the point in time at which the Link between the St Georges and Coton Hill Institutions really began. 1852 – Smallpox fatally prevalent in part of the Town. The first case in the Asylum was also severe and fatal. There were 9 Male, 2 Female Patients and 1 Attendant affected. It was found that a Male Attendant brought it in from the Town unaware of having a mild attack. Cases were isolated on one ward and the Male Population was re-vaccinated – ( Why were the Females not included ? ? ). There had been 166 admissions that year including (Males) – a Cotton Carder, a Currier, a Police Officer, 2 Solicitors and a Dancing Master. (Females) – a Buckle Coverer, 2 Governesses and 2 Ladies. The Total number of patients now being 515. 1853 – There was overcrowding but all believed that would be relieved when Coton Hill was opened. There had also been much confusion and discomfort during the last few years due to extensive upgradings and renovations but things were a bit more settled now. The Commissioners visit reported on finding the greatest order and decorum throughout, with no one in seclusion. They also noted the alterations to the warming apparatus and laundry. A large proportion of Male patients were working in the Gardens etc. where all the vegetables and fruit for the hospital were grown on the premises. Butter and milk came from the Hospitals own herd of 14 Dairy Cows. Most of the clothing and shoes were being made in the Hospital and even supplied a neighboring Hospital from its surplus. 50 of the male patients were helping to build Coton Hill. That year amongst admissions were 1 Female Strolling Player and 1 Male Spur Maker. 1854 – In his last year as Superintendant Mr Wilkes states that, amongst admissions there were – 28 cases of Intemperance, 5 cases of Overwork and 6 cases of Religious Excitement, – 2 Boatmen, 1 Clogmaker, 1 Hingemaker, 1 File Maker, 1 Sawyer and 2 Spur Makers. He noted also that this year the Number of Female Patients would have exceeded the number of Males. Cost of Medicines was £77 4s 2d, Food and Diet no change. Steam Power was put in to the Laundry to work the Washing and Wringing Machines, and it was also proposed to heat the Hot Water systems by this method. However, as the Hospital Engineer was not resident at this time, a cottage was to be built for him to also serve as The Back Lodge, this being at the junction of Corporation St./Crooked Bridge Road. There was also a proposal to enlarge and extend The Chapel. The Committee Report to the Quarter Sessions noted the General Good Conduct of Hospital Officers and Servants – with a Few Exceptions (Not Stated) – The Asylum is evidently functioning under very able Management, and they were satisfied with the beneficial effects of the absence of all coercion.They were pleased by the provision of recreation and employment – many of the patients being employed and a good number outdoors. The remaining Private Patients, about 50 in number, had been transferred to the new Institution at Coton Hill on it’s opening. As a result all were looking forward to a reduction in overcrowding, especially on the Male Side, somewhat of a vain hope ? Mr Wilkes was thanked and praised for his diligent efforts and exertions towards the opening of Coton Hill. Receiving the offer of the post of Superintendant for same, he politely declined. 1855 – Having been appointed to a post as a Lunacy Commissioner, on the recommendation of Lord Shaftesbury – The Lord Chancellor, Mr Wilkes retired from the Stafford County Asylum. He continued to work as a paid Commissioner and Asylum Visitor/Inspector, maintaining Links to both The County Asylum and the new Coton Hill. On retirement from these duties in 1878 he would continued as an Honorary Commissioner until shortly before his death in 1894.